F2 is the brainhild of German writer and and wine aficionado Max Hoetzel, who in 2013 years ago found himself living amidst a vineyard in Santa Ynez. With the help of his mentor winemaker Steve Clifton he started making exciting Cabernet Franc, Cabert Sauvignon, Syrah and Sauvignon Blanc. With the philosophy, that great farming is beginning of great wine, Max lets the fruit shine, keeping the winemaking process in the winery as minimal as possible. The name F2 stems from emperor Frederick II, a medieval ancestor who has inspired Max's historical studies and his own life for many decades. The wines of F2 are a nod to this singular historical figure, who contemporaries called "The Wonder of the World" and historians dubbed the "First Modern Man". 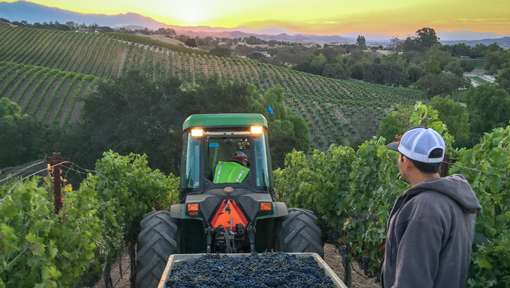 All grapes are Estate grown at the Great Oaks Vineyard in the Los Olivos District and painstakingly groomed for greatness. Our vineyards In Santa Ynez (Los Olivos District) are organically managed with focus on the best possible fruit for our wines. 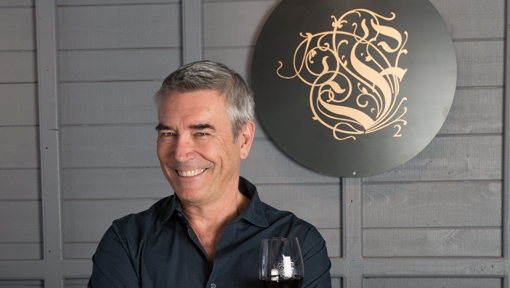 Max Hoetzel, owner and winemaker at his tastng room in Los Olivos,California.